How fast do swords move? To tell you the truth, the motion capture I took didn’t turn out all that great. Normally this means that I should just get better footage and try again (which I will in the future), but there is still something important that can be learned from this. I did get some data out of it, and as there isn’t a whole lot of data going around out there, it is still valuable. Others can hopefully get inspired — and learn from my mistakes — to try this themselves. Having seen lots of videos of cutting competitions in the past, I know that it is impossible to see the blade during its cutting arc. It moves too fast, and isn’t captured ‘on film’. To counteract this, I was hoping to add some markers on to the sword. Even if I couldn’t make out the blade, maybe I could make out a colored blur? The sword I used was my Albion Crecy. The color was red, owing to that being the only colored duct tape at the dollar store I stopped at in the morning. Lessons for next time #1: Do some research as to which colors are the most high-contrast on film. And as I make sure to cut with the proper part of the sword, tape on the tip doesn’t pose a problem. I had several phone cameras on me from different angles, all shooting in slow motion. I captured a few cuts, but I’ve only processed the video for the one which looked the best. This was a right descending cut, with what I would call my ‘standard’ form. I wasn’t trying to control the blade to be minimalist, nor was I trying to achieve the maximum cutting potential. I was simply doing a nice relaxed swing through the target. Care to tell me exactly where the tip of my sword is? Use a sword with a wider tip. 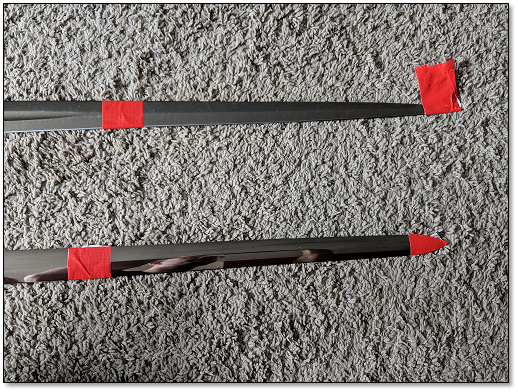 The Crecy has a very narrow point, something like a Cold Steel Hand and a Half would have a much bigger tape surface to track. Add a tracking point to the middle of the blade. This region is moving slower, and shows up better on film. Make the tape portion on the end of the sword into a ‘flag’ to make it larger, and easier to see. Top: Albion Crecy with tape flag. Bottom: Cold Steel Hand and a Half. By someone standing at 45° to me, the least helpful of the angles shot. In .m4v format, which Tracker won’t open. Lessons for next time #2: Know the capabilities of people’s phone cameras beforehand and position them accordingly. The first step is to take a look at the front view. This will allow me to capture the angle of the swing. Not bad for consistent line. The video for this was also a little rough, so I had to eyeball the tracker placement on the hit. Overall it shows a fairly consistent line of the cut. 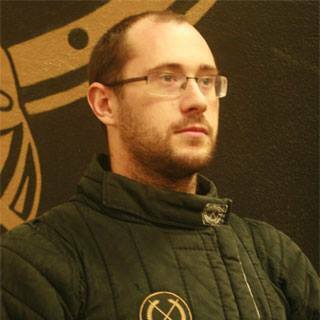 This is unsurprising, as that is the way I train and I’ve cut through wide targets on many occasions. 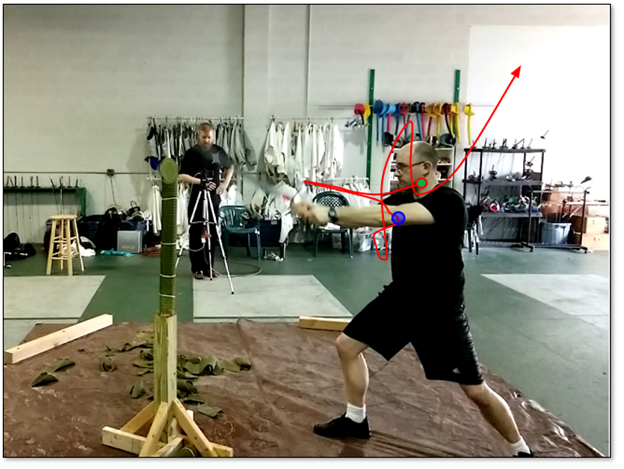 After calculations, the sword appears to be traveling at an angle of 64°. While this isn’t perfect, I assumed that the sword was moving on this consistent angle the entire time. Saves me the enormous hassle of trying to sync data from two videos, and honestly since I can’t see the tip on the front anyways I don’t think I’m exactly losing out on any accuracy. It doesn’t say 64° in the picture because I’m lazy and want to re-use it in future articles. I did my best estimating the tip position, but it didn’t turn out all that great. Notice how squiggly the blue line ends up. Looking at the cut in slow motion also makes me cringe at all my technical errors. Do as I say, not as I do! So in order to get any useful data from the tip speed, we need to do some filtering. The one on the left is what it looks like using my chicken-scratch guesses as to where the tape is. The one on the right has some work done to make it to look like something that actually happened in the real world. You might be wondering what ‘impact node’ means. It means the point on the blade where it makes contact with the target. The reason it gets called node is to clearly differentiate it from the ‘impact point’, which also refers to the instant that it makes contact with the target. The peak speed of the cutting part of the blade was about 20 m/s. This is about 72 km/h, or 48 mph. The blade reaches top speed just a few inches before impacting the target, so I’m fairly happy with that part. The center of rotation of an object is a point about which we can consider an object to be rotating. 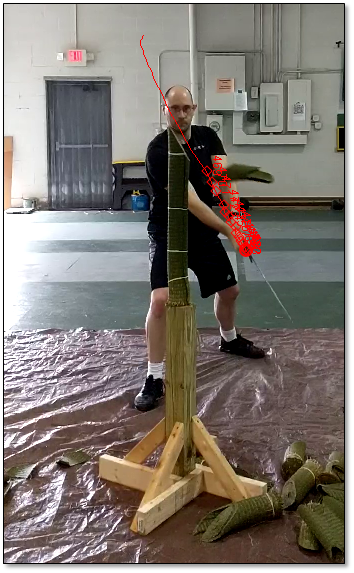 If I were to take a (short) sword in my hand and do arm circles, then the center would be more or less on my shoulder. 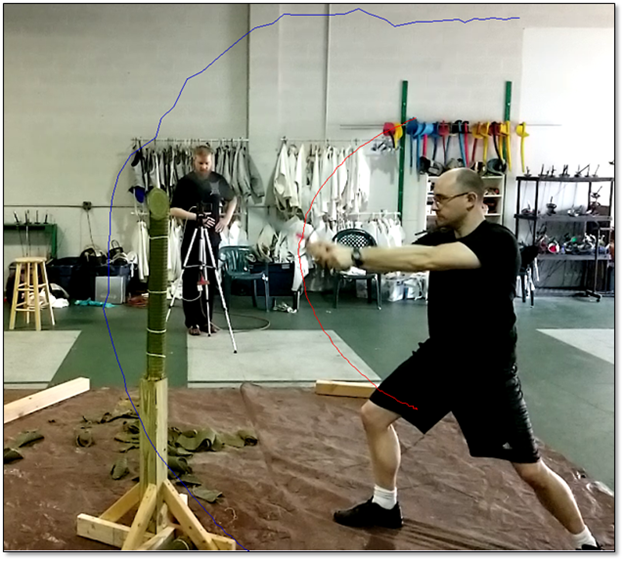 If I was doing stuff with my elbow/wrist to rotate the sword as I was also rotating around my shoulder, then the overall center would be a combination of these movements. This cut started from high Vom Tag, and followed through with more or less straight arms. So you would expect a center somewhere around my shoulders/chest. The data is a little messy for this, but I was curious as to where exactly the center of rotation was when I was cutting. Naturally it moves around due to the mechanics of the cutter. The cut starts at the green dot, the impact point is the blue dot, and trails off toward the arrow. 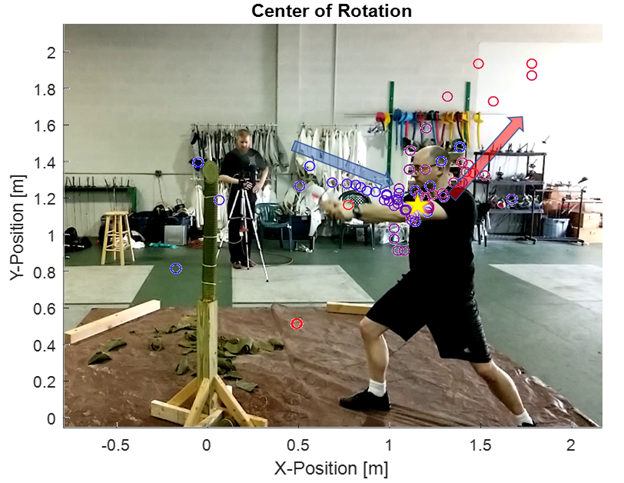 Unsurprisingly, the Center of Rotation is near the core of my body when I make contact with the target. But what I find surprising is how far forward it goes! I always assumed that it would be right at my shoulder/spine the whole time. This is something that definitely merits more investigation. The other interesting thing is how the Center of Rotation trails off as I am stopping the sword at the end. I would be interested to compare it to some footage of me flowing through on a cut rather than stopping the sword. The cutting surface of the sword moves at approximately 70 km/h. The tip is moving faster, but it’s not really the part that I care about. I need to get better at taking video. Not unsurprisingly, this just made me want to ask even more questions. Have fun until next time! 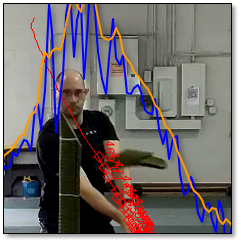 The data was filtered with a centered moving average filter. 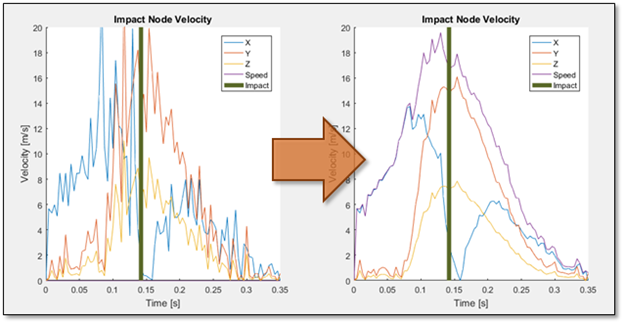 The plot of velocity used was prepared with a filter window of 40 msec, and weighting function that decreased the total weight by 20% every 4 msec. When doing the Center of Rotation calculations I went a little bit wider, with a 80 msec window, and decreased the weight by 10% every 4 msec. The actual center of rotation data was, unsurprisingly, a little noisy. This is a scatter plot of all the computed centers, with a blue -> red color gradient applied based on the time of the calculation. I’m not even sure what I would have to do to achieve those rotational centers in the middle of nowhere…. The one thing that I did not take into account is the effect of perspective on the measurements. The video presents a 2-D image, of what I defined as the X-Y plane. However it is not a pure projection on the X-Y plane, there are perspective effects. 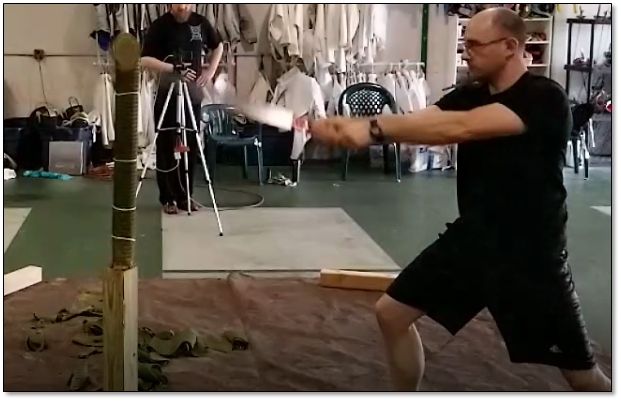 As the tip of the sword moves in the negative z direction (away from the camera) the scale decreases, and as the tip of the sword moves in the positive z direction the scales increases. The scale was set on the tatami plane, so the speed distortion increases as you look at the beginning and end of the cut. 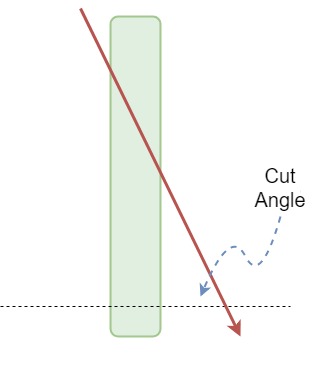 This is also when the sword is moving it’s slowest, so the magnitude of the effect on the velocity should be mitigated. It is something I will have to compensate for in the future as I improve my data processing scripts. Time to dust off all those old linear algebra textbooks. HEMA Ratings – Does it actually mean anything? Does Bracket Seeding Mean Anything?